Today’s smartphones might have ultra-fast processors, full HD displays and tons of RAM, but we can’t help feeling like they are missing something. Where’s the clamshell design and numeric keyboard? Left behind in the late-90s you say? Nah, Samsung seems to think there is plenty of room in 2013 for an Android powered flip-phone. Several Korean news sites are buzzing today about Samsung’s alleged plans to launch a new clamshell phone next month in South Korea, under the name Samsung Galaxy Folder. The word of the phone’s imminent release apparently comes directly from an unnamed Samsung exec. The big question now is whether any one wants a low-end smart flip phone these days, in Korea or even abroad. As you might expect, the Galaxy Folder is supposedly aimed at the entry-side of the smartphone market and that means pretty meager specs. The clamshell will have a dual-core Snapdragon S4, LTE support, a UI designed for flipping, and a low-rez 800 x 480 display. As for the OS, the phone will pack the latest Android 4.2.2 Jelly Bean. Releasing a new Samsung flip phone might seem totally out of left field, but to be fair, this isn’t their first go at such a flipping Android device. 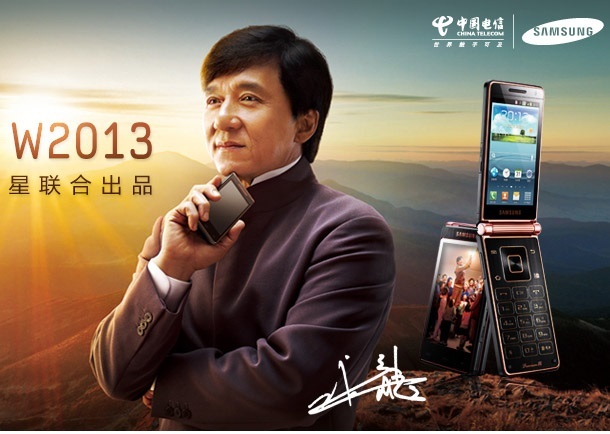 Just last year, the Korean giant released a similar ‘premium’ device (pictured above) for the Chinese market, even going so far as to have the phone be endorsed/advertised by Jackie Chan. The big question is whether any one wants a low-end smart flip phone these days, in Korea or even abroad. That’s a tough question, but it’s certainly possible that such a device could prove to have a small following among consumers that are still clinging on to their clamshell-styled not-so-smartphones. What do you think, could the Samsung Folder find niche success or are full numeric keyboards completely pointless with today’s advanced touchscreen technology?